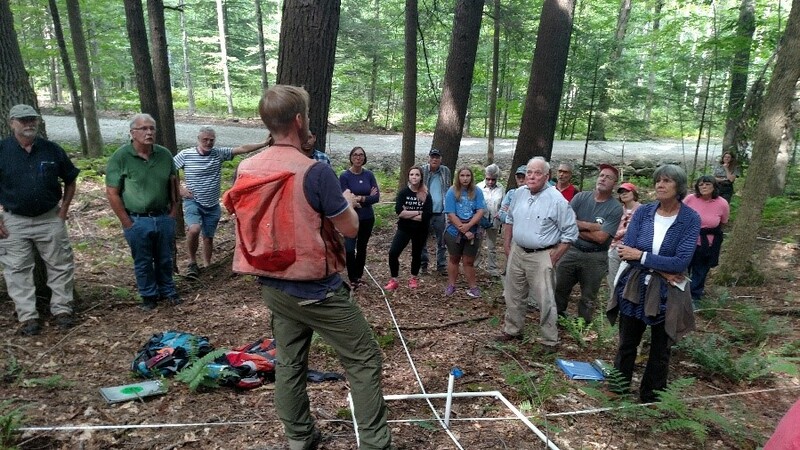 In Vermont, mosquitoes carry West Nile virus and eastern equine encephalitis virus, and ticks carry Lyme disease, anaplasmosis, and babesiosis. There is no absolute protection against being bitten by an infected mosquito or tick, but there are precautions when taken together that substantially reduce your risk. Health Vermont and other trusted authorities recommend wearing long-sleeve shirts, tucking long pant legs into boots, and conducting a thorough body examination after going back indoors. Insect repellents can further reduce risk, but no synthetic or natural chemical repels 100% of mosquitoes or ticks all of the time. A single bite can transmit disease. The United States Environmental Protection Agency (EPA) requires proof that registered products repel pests named on the label, but allows some natural chemicals considered to be safe to be sold without registration and without proof they repel insects. This loophole allows products to be sold that may or may not work or that may work for such a short time as to be functionally ineffective. Examples of ingredients used in unregistered repellents are: cedar oil, eugenol, geranium oil, peppermint oil, lemongrass oil, rosemary oil and soybean oil. Catnip (or catmint) oil extracted from leaves. Registered products have “EPA Reg. No.” with the individual products number usually on the back side of the container. Read the entire label, including the fine print, as if your health and safety depended on it! Not all of these compounds repel ticks. Most products that repel mosquitoes also repel black flies. DEET, citronella, and catnip oil products include a warning to use soap and water to wash skin and sometimes clothing after use. Most repellents may cause skin irritation and should not be applied to cuts, sunburned or otherwise damaged skin, such as after shaving. 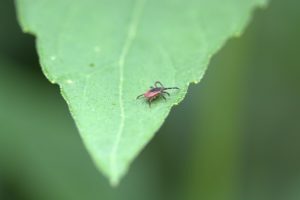 Generally, a product states how long it is effective for ticks, mosquitoes, and black flies and how many times each day a product can safely be applied. These warnings also apply to products used to treat your lawn for mosquitoes and ticks. Only EPA registered products have been reviewed for safety and efficacy. Scrumptiously follow the label, including time between application and when you or your pets can reenter the treated area and other instructions for keeping the chemical off pets and humans. *Dr. Andersen retired to Barnard from the EPA where she managed natural pesticides. She has a PhD in Plant Pathology from University of Maine and a Master of Science from the University of California, Berkeley. This is my third season as coordinator for the two community gardens in Woodstock. I’ve enjoyed planning the garden season, helping orient new members, and organizing work days and potlucks. This year, however, in addition to my normal coordinator duties, I have the unique pleasure of maintaining a garden plot as well. For the past few years, my husband and I have grown a small vegetable plot together in our backyard. This year we are living in a new place and don’t have access to a garden space at home, so the community garden plot was a perfect fit for us. Instead of planting our usual repertoire of leafy greens and carrots, we decided to try our hands at something a little different. We chose to grow corn, beans, and squash – collectively known as the Three Sisters. We had both heard of this interesting trio and wanted to see if we could successfully farm them ourselves. Corn, beans, and squash were the main agricultural plants cultivated by a number of Native American groups in North America. Together, they contain complex carbohydrates, essential fatty acids, and all eight amino acids, providing a balanced diet and allowing most tribes to thrive as vegetarians. The Three Sisters were also essential to peoples’ spiritual well-being. Native Americans believed they should always be planted together, eaten together, and celebrated together. Over thousands of years of agricultural experimentation, Native Americans developed a unique system of planting in which each of the three crops contributes something to the group. 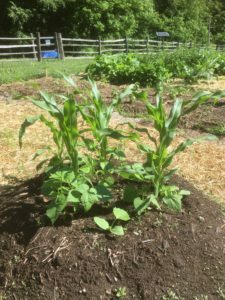 The corn stalks serve as a pole for the beans to climb, the beans fix nitrogen in the soil, and the sprawling squash leaves shade the area, keeping weeds at bay and holding moisture. Today we call this style of gardening ‘companion planting,’ but Native Americans were doing this long before the term existed. They understood instinctually that crops planted as a whole ecosystem would be stronger than if planted separately. Planting the Three Sisters is simple, but must be done with careful consideration of timing and space. Prepare the soil in spring by adding aged manure or compost to increase fertility. Make a flat mound of soil about a foot high and 4 feet wide. When danger of frost has passed, plant corn in the mound by sowing six kernels about 10 inches apart in a circle about 2 feet in diameter. When the corn is 5 or 6 inches tall, plant three pole beans evenly spaced around each stalk. A week later, sow five winter squash seeds around the perimeter of each mound. What you will end up with is corn in the middle, beans growing up the corn, and squash plants filling the empty space around the mounds. The specificity of this method may sound a little funny, but it has proven itself over thousands of years of agriculture. The numbers listed are intentionally exact and designed to form the most efficient system. If you plant too closely, the space will be crowded and unproductive. If you don’t wait until the corn is tall enough, the stalks could become overtaken by the beans and stop growing. If you are interested in seeing this Three Sisters planting in person, come on over to the community garden at Billings Farm. There are lots of other wonderful plots to enjoy as well. Located on Billings Farm and King Farm properties, the community gardens are a project of Sustainable Woodstock and open to all community members. The cost is $40 for the first plot and $25 for each additional plot. The gardens are full this year, but if you would like to be on the list for next year please email cassidy@sustainablewoodstock.org. For most backyard gardeners, growing and sustaining a garden is a process of trial and error. Every year we learn something new. We focus on one thing but overlook something else. And we vow to never let that happen again. After a decade of gardening, I still get goosebumps when those first seedlings poke through the earth. And I marvel at the miracle of every tomato, green bean, and zucchini that eventually comes into being. Because I know, from experience, that every successful garden is the result of hard work, learning from mistakes, and a little luck — even professionals aren’t immune to universal gardening threats like weather, disease, and pests. This summer, as we hit the trails and head to our local farmers’ markets, we’re reminded of the importance of maintaining the health and vitality of our local ecosystem. We hope you’ll take advantage of these fun and informative programs offered by community organizations. 10th Annual Trek to Taste: Saturday, June 2, from 10 a.m. to 3 p.m. This celebration of trails, local food, and healthy living will be hosted at Marsh-Billings-Rockefeller National Park and Billings Park. Guided walks start at 10:30 a.m. and noon. Or grab a map and venture out on your own. Along the way sample free, delicious foods from local producers. Enjoy family games, arts and crafts, demonstrations, an ice-cream social, music, and more. Free event. For info: trektotaste.info.